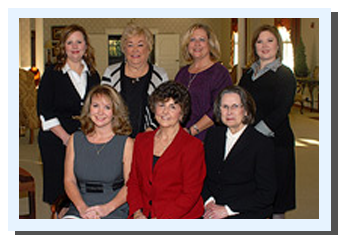 One of the things we are very proud of at Carl J. Mowell & Son Funeral Home is our staff. They have over 290 years of combined service helping families. From working funerals to filing paperwork to keeping the grounds maintained, our staff goes beyond the call of duty. 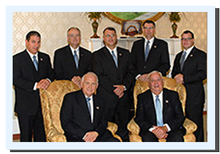 Our funeral directors have been serving families for many years. C.J. Mowell, Jr. started this business with his father, Carl Mowell Sr., over 52 years ago. Before that he worked at funeral homes in East Point and Newnan. Bee Huddleston, a native of Fayette County, has been working with us for at least 50 years. David Mowell was raised upstairs at the funeral home in Fayetteville and has been working full time since 1993. Chris Cumbie, who also has roots here in Fayette County and been in the funeral business for almost 25 years, has worked for Mowell for over 12 years. Dave Threlkeld, who has worked at funeral homes in Georgia, California and Texas, has several years experience. Greg Bade works and lives in Peachtree City and has served families since graduating from mortuary school in 1983. 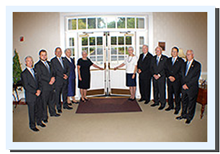 Wes Markham, our newest licensed funeral director, completes our group of funeral directors who are ready to serve you. Ron Lee is a licensed funeral director who handles our pre-need program. Our support staff includes Lillie Earnest, JoAnn Wilson, Ann Linch, Janelle Taylor, Lyman Mann, Joe Shaw, Winston Brown, Lawrence Jacobs, John Christopher and Tommy Carroll. Faye Mowell, April Mowell, Devy Kleppinger, Laura Thomas, Gayle Harp, Jenny Jackson, and Dawn Dickson handle all the paperwork and office demands. All these men and women help us take care of the needs of each family. Our staff is made up of people from our community. They belong to local churches and organizations, shop at local stores, have children who attend our local schools, and are all here to help meet the needs of the families we serve.